Many people with inflammation go through the same motions every morning. We all wake at the same time, drink our favorite morning beverage (mine is coffee), eat breakfast, and so on. If you’ve noticed that your days aren’t going so well, how you approach this time of day is probably a factor. #1: Everything that you do (and don’t do) in the morning affects how the rest of the day unfolds, for better or for worse. 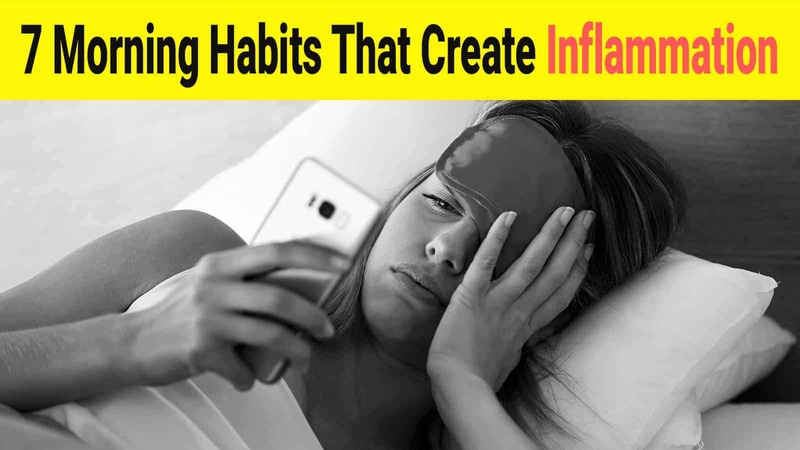 #2: Your inflammation levels directly impact #1. In other words, getting your inflammation game right can go a long way in helping set you up for a happy, productive day. If you prioritize eating right, reducing stress, and getting organized before you head out, for example, you have a much higher chance of feeling balanced and focused all day long. In this article, we’re going to discuss seven counterproductive habits that create, sustain, and worsen inflammation. We’ll also go over a few steps that you can take to re-calibrate the inflammatory response. Ready? Let’s do this thing! Eating a bunch of processed foods first thing is a surefire way to send your inflammation markers – chemicals that “measure” inflammation levels – into a screaming frenzy. Foods that fall into this dubious category include doughnuts, sugary cereals, cookies, pastries, frozen and boxed food products, and refined foods. Doing breakfast right: Think of and treat your body as the high-performance machine that it’s designed to be. What would you put into the gas tank of a Porsche? Premium fuel, right? Well, your body’s premium fuel is healthy fat, fiber, and protein. Struggling to get out of bed in the morning is a probable sign of not getting enough restful sleep. This is bad because pro-inflammatory messengers called cytokines are at elevated levels when sleep loss is a regular occurrence. Worse, this phenomenon can alter the body’s equilibrium state to such an extent that these cytokines remain at high levels during times when the person tries to catch up on sleep. In other words, if sleep deprivation is allowed to continue for an extended period, the body will reverse its natural tendency to act against inflammation during sleep. Get your beauty sleep: Four great bedtime habits will go a long way to getting your inflammation – and your circadian rhythm – back in check. First, synchronize your body clock by going to bed and waking up at the same time every day, weekends included. Second, resist the impulse to nap or remain stationary during the day. Third, limit your exposure to artificial light (e.g. digital screens) during the evening hours. Finally, stick with non-alcoholic and caffeine-free beverages during the evening hours. Some of us tend to be rather mindless in the morning, particularly on the days when we need to commute to work. Do you find yourself rushing around trying to find something to wear, gulping your coffee, and/or frantically scavenging for the now lost (sorry, “misplaced”) car keys? It doesn’t take an expert on mental health to ascertain that rushing around in the morning isn’t conducive to wellbeing. You may be surprised to know, however, that these seemingly “minor” inconveniences can wreak major havoc on our hormones and inflammation levels. Habituating this undisciplined approach to mornings is a recipe for disaster. “Slow down there; speed racer!” So maybe the morning got off on the wrong foot. It happens – especially in the A.M. But try not to get too worked up over it. Ease into the day by practicing some meditation, journal writing, reading, or some other activity that promotes feelings of positivity and empowerment. The resulting shift in mindset is truly astonishing! You had to know this one was coming, right? Indeed, staring at your social media and text messages can manifest a potent stress response, something that you don’t need. Especially when just getting out of bed – or trying to! Something to keep in mind: emotional stress is the leading cause of inflammation in the body. Digital media is one of the top producers of emotional stress. Add two and two together, and you’ve got a good reason to cut back on your social media use – at least first thing in the morning. Not much of a shocker here, eh? Sugar is a significant contributor to whacky inflammation markers. Probably not a big deal in the short-term, but making a habit of downing cups of sugar-coffee may contribute to chronic inflammation problems. Chronic inflammation is a leading cause of dangerous and potentially fatal health conditions, including cancer, diabetes, and heart disease. Moderation, Moderation, Moderation: Most people who have issues with inflammation stemming from poor diet make a habit of consuming things like sugar. Again, the point here is not to eliminate the things that you enjoy from your plate, cup, or bowl, but to practice eating and drinking in moderation via mindful discipline. Of course, you should also know if you have a family history of diabetes, heart disease, hypertension, or any other medical condition that may require medical oversight and dietary intervention. It can be challenging to be equanimous at the crack of dawn, especially if you’re schedule is packed full. But you don’t need to possess Dalai Lama-ish composure in order to approach the day with a bit more calmness. Our aim here is to dial down on the inflammation, and we can’t do achieve that aim while looking at our day ahead in disgust! Singletask, Singletask, Singletask: Remember this old riddle? “How do you eat an elephant? “One bite at a time.” Most of us have had those days where we approach each task in our schedule with one thing in mind: the next task in our schedule. Multitasking most certainly isn’t the answer. In fact, multitasking may not even exist. So, what is the best approach? Doing one thing at a time. Direct all of your cognitive reserves onto the task at hand. Single-task. Try it and thank us later. “Huh? How do you hit the gym wrong?” This writer thought the same thing when researching. But it turns out that there is a wrong way to approach exercise in the morning. Two ways, actually. The first is not even trying to get in any semblance of morning physical exercise. This is not advisable for obvious reasons. The second is engaging in an overly vigorous workout regimen. Both can cause your body to rebel by hitting you with a flood of stress hormones. Take It Slow and Easy: Light exercise is totally okay, especially when you’re trying to watch your inflammation levels. Consider incorporating a mindfulness exercise – meditation, mindful walking, yoga, etc. – with a light physical activity or a medium-intensity workout class.